William Dunlop became the first rider ever to top 200mph at the MCE Ulster Grand Prix on Thursday. Former Mar-Train Racing team boss Tim Martin says he is bitterly disappointed that William Dunlop has been ruled out of the Superbike races at the MCE Ulster Grand Prix. 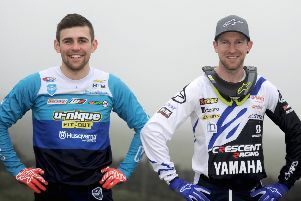 Dunlop injured his left wrist in an incident at home and despite showing plenty of promise in practice, the Ballymoney rider has conceded defeat in his efforts to compete in the 1000cc classes on the Temple Golf Club Yamaha machines. William Dunlop on the Temple Golf Club Yamaha R1 at Dundrod. Martin threw Dunlop a lifeline earlier this season when the Ballymoney man’s deal to ride for Halsall Racing fell through and on Thursday he admitted Dunlop had no option other than to sit out the premier races at Dundrod. “We are extremely disappointed to have to withdraw from the event but William is not fit enough to compete competitively over a race distance on the big bikes so it is the correct decision to make,” said Martin. “We were expecting to be in the fight for at least podiums based on the performance of our bikes at this event last year but for the second time in two years a non-racing accident has left us on the side lines which is very frustrating. “We had put more development work into the bikes recently including testing some new parts at Oulton Park and that showed as William was fourth quickest in the opening Superbike session despite his injury. “To be the first machine to ever post 200mph at the world’s fastest road race shows just how strong the Yamaha now is and it is a shame the fans don’t get to see it out on Saturday. The bikes are now available for purchase as the UGP was the end of our agreement with William for 2017,” he added. Dunlop qualified fourth fastest in the Superbike class with a lap of 132.606mph and also became the first rider ever to break the 200mph barrier, clocking 200.4mph on the R1.